Many people see my dive gear, and ask “What newfangled contraptions is that”? Ok, maybe they don’t use the word “newfangled”, but you get the point. I dive a Closed Circuit Rebreather (aka CCR). While people think of these as “new”, they actually predate the gear we consider standard SCUBA (also called Open Circuit or OC). History: Early rebreathers were used not for diving, but for escape. Mines and Submarines both presented situations where a compact breathing device was needed to allow crews to escape to safety. Theses were developed back in the early 1900, and produced in quantity by 1910. Open Circuit SCUBA was not commercially available until the mid 1940s. How do they work: Let’s start with a quick review of metabolism. Our cells take in food and Oxygen (O2). These are combined to produce energy, but have a toxic byproduct of Carbon Dioxide (CO2). Our Cardiopulmonary system takes some of the O2 from the air we breath, and distributes it to our cells. At the same time it takes the CO2 generated by our cells, and releases it into the air that we exhale. The O2 and CO2 exchanged by our lungs is actually a small percentage of the volume of gas that we breath (about 3%-5%). On Open Circuit, when a diver inhales, the regulator provides the diver with gas (usually air) at same pressure as the surrounding water. When we exhale, the gas is vented out into the water producing the column of bubbles associated with diving. When a CCR diver exhales, the gas is vented into a flexible chamber called a counter lung. Within the Rebreather, O2 is added back into the gas, and it is passed through a “scrubber” which removes the CO2. We then inhale the same gas which again contains the proper O2 percentage. With OC 95% of the gas we exhale has not been affected by our respiration. It is not used. It is wasted. On CCR, this 95% is recycled, cleaned of CO2, enriched with O2, and breathed again. This allows us to make use of smaller tanks, as our O2 consumption does not change with depth. It’s a common question. Many have seen SCUBA divers on TV, but don’t know what it is, or how it works. The above gear is often referred to as the “SCUBA unit”. 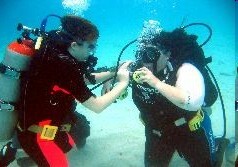 There are other forms of SCUBA, but this is the most common. We really can’t dive without this gear, but it’s not exclusive to SCUBA diving. There is also a variety of safety gear used in SCUBA diving. As the diving conditions become more challenging, the amount of gear increases. Below I’ll cover each piece of gear in more detail.